Installer and contractor evaluation programs identify the companies and individuals with the necessary qualifications to provide superior quality installations. Prior to the 1980s, the now 300-plus-page TCNA Handbook was but a 25-page booklet. This is because there were only a few methods of setting tile: bonded mortar beds and unbonded mortar beds, also known as mud set methods. Mud set installations are good because they withstand building movement, and they require that installers create their own substrates, resulting in super flat finished installations. But, even though mud set is still recognized as the best choice for many scenarios, including within the pages of the Handbook, most jobs are being specified as thin-bed installations. They’re thinner and significantly lighter, so floors don’t need to be recessed to accommodate the thickness of mud and lighter duty framing materials can be used. They’re also faster and less expensive to install. In short, thin-bed methods have made tile more affordable and more readily available to everyone, so it’s easy to understand why the newer ways of installing have become the norm. Thin-bed installation methods have also made the trade more accessible to workers because they are less labor-intensive and don’t require years of training before even the simplest of installations can be attempted, like mud set installations do. But along with all these positives comes a major challenge. With mortar bed methods in use for hundreds of years, there was a culture of tile setting, a fraternity of sorts, of the tradesmen who knew how to turn a pile of sand and a couple bags of cement into substrate, setting material and grout. Anyone who could do this was, by necessity, thoroughly trained. It took years to learn, and that served as the trade’s built-in training and quality control mechanism. Fast forward to today. How does a homeowner or general contractor choose a tile contractor when the mechanism that virtually guaranteed a good installation has all but diminished? Add in the fact that the consistent uptick in tile consumption over the last 50 years has attracted new workers and business owners who have recognized tile installation as a growth industry with few obstacles to getting started. To be sure, many of them are good companies and installers, but less-skilled workers and less-qualified business owners have set up shop as tile contractors too. The perception — popularized by television shows, internet blogs, YouTube and the like — that tile setting is so easy you can do it yourself, is a fallacy that oversimplifies the craft. While materials exist now that make it look easy, knowing the right materials for the project and installing them properly to last the life of the building is in some ways even more difficult than mud setting is. With all the improvements to setting materials through the years, drastic changes in building construction practices, and the overwhelming preference for larger and larger tiles, tile setting now requires as much technical knowledge as it does new skills. Industry associations have responded with programs that define and certify skills and credentials of installers and contractors. The Ceramic Tile Education Foundation (CTEF) tests installers for basic knowledge and skills in thin-bed installation through its Certified Tile Installer (CTI) program, while apprenticeship programs, most of them administered through unions, train installers in thin-bed and mortar-bed methods over several years, culminating in recognition by the U.S. Department of Labor (DOL), of the installer as a Journeyman Tile Layer. 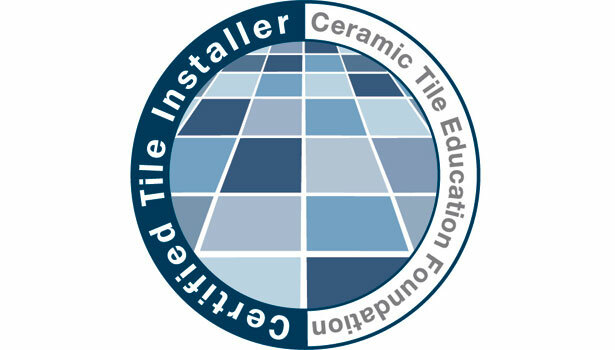 DOL-recognized Journeyman Tile Layers and CTIs are now able to take their credentials to the next level by earning any combination of five new task-specific certifications available through the Advanced Certifications for Tile (ACT) program: shower bases, membranes, large-format tile and substrate preparation, wall mud and floor mud. These newly available certifications together represent the most popular installation types, and the most crucial and demanding installation skills, needed by installers today. Other types of programs focus on contractor qualifications, such as the Five Star Contractor program, offered through the National Tile Contractors Association (NTCA) and the Trowel of Excellence program, offered through the Tile Contractors’ Association of America (TCAA). These programs provide benchmarks for quality and a mechanism for making an informed decision when selecting a tile contractor. Currently about 50 companies have earned Five Star or Trowel of Excellence recognition, and CTEF has certified about 1,000 installers. Participation in these types of programs led to the inclusion of a first-ever reference to installer and contractor qualifications in the TCNA Handbook in 2012. The language recommends that specifications require references and a portfolio to ensure the installer and contractor have successfully completed work of similar size, scope and complexity. “A home or any building today is one of the few things still made entirely by hand and every aspect of a tile installation relies on the tile contracting company and its installers. How good the finished installation looks, how well it performs and how long it lasts are in their hands,” it says. “It is for this reason that the Handbook Committee and the Tile Council of North America strongly recommend using installers who have demonstrated their commitment to their craft and taken the time to stay current with the latest materials and methods. Because tile is a permanent finish, the lowest bid should not be the driving factor, but rather who is the most qualified to perform the scope of the work specified.” The Handbook further identifies two important requirements for meaningful credentialing: 1) for installers, a hands-on component to assess workmanship skills, and 2) for installers and contractors alike, failure or exclusion of those who don’t meet the qualifications. Together, contractor and installer turn drawings and specifications into reality. The installers marry the field conditions to the selected materials and patterns. In addition to being ultimately responsible for the installers, the tile contractor supplies materials and manpower, should limit risk and liability for the property owner and must collaborate with the general contractor on any jobsite issues that could compromise tile installation performance, appearance, cost or schedules. When meaningful proficiency requirements are utilized to ensure only fully qualified contractors and installers are engaged, the transformation from construction site to finished space can be as dramatic and seamless as a caterpillar’s metamorphosis into a butterfly. We look forward to the continued expansion of such programs, and we encourage construction and design professionals to integrate them into the quality assurance strategy for every project.